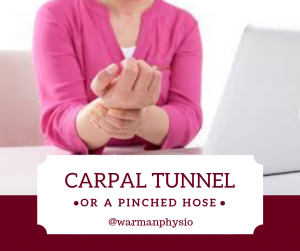 Carpal Tunnel – or a pinched hose? A 28 year old individual came into the clinic with right sided dull forearm pain, tingling with pins and needles into the hand. The pain started without any cause and has just gotten worse over the last two months. It also seems that the hand is worse at night and in the morning. They have started having difficulty holding heavy pots and pans, and opening tight jars – which they don’t recall having difficulty with before. 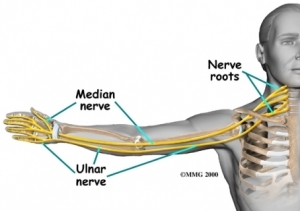 Although there are many reasons why someone may have pain in the forearm, wrist, and hand, let’s go through some of the possible reasons WHY this happens, what we can do about it, and how you can start your road to recovery TODAY! 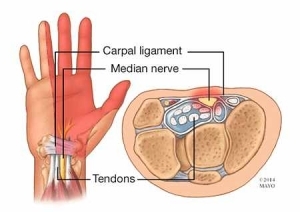 To have a true Carpal Tunnel Syndrome, the issue is specifically coming from the wrist – the tunnel in which one of the nerves (the median nerve – see above) of the arm goes through and into the hand. More often than not, there will be other contributing factors to wrist and hand pain! So how can we determine what the contributing factors are? Some people will find that if they are looking one direction that their hand symptoms will get better or worse. Others will find that the chair that they are sitting in will seem to impact their symptoms. If you have hand and forearm symptoms like pain, tingling, or numbness, a physical therapy assessment could benefit you! What you may expect from this assessment is a postural assessment to look at your alignment, flexibility of the upper body muscles, mobility of the spine and neck, shoulders, elbows, and wrist, with an evaluation of how you move. In many instances by the end of the assessment there is a clear driving factor to the pain and symptoms that can begin being addressed by home programming. This will put you in charge of feeling better, and not relying solely on having to come to the clinic to improve. 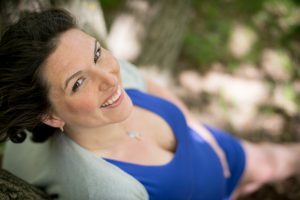 Your therapist may provide you with a variety of homework items including stretching of muscles that are providing too much tension, strengthening of muscles that aren’t providing enough support, give exercises that will help the nerves slide and glide, and to help the joints move with more symmetry to restore balance. A common question we are asked is how long until I’m better? The recovery period will vary from client to client, depending on the severity and frequency of signs and symptoms, the duration of symptoms, the activity level the client is needing to maintain, and the commitment to their program. Typically, with a straightforward case we tend to see client’s 1x every 1 to 2 weeks for a total of 4 to 6 sessions. These sessions include manual therapy to help restore joint, neural, and muscle mobility as well as progressing exercises for your home program to help you help yourself. This individual having experienced pain for a relatively short period of ended up having stiffness in the neck and the position of the head changed their symptoms quite a bit. Getting started with some stretches and movements to help the neck, shoulder, and forearm move better, was the first step along with some manual therapy in clinic. The client at the next appointment the following week had a significant improvement in symptoms and found the stretches very helpful with managing their pain. Treatment continued to progress and included range of motion, stretching, and strengthening. When the client came in for their last appointment (a short 5 weeks later!) they were pain free, and able to manage their symptoms quickly themselves if things started to get sore. Don’t delay! Schedule your assessment today to get started your journey to recovery! Haylie has been practicing pelvic health and focused in prenatal and post-partum care since graduating from the U of S MPT program in 2011. Officially adding to her practice pediatric pelvic floor therapy in 2017. She has been advocating for treatment for women, ensuring appropriate and effective care throughout pregnancy and post-partum, and helping all expecting and post-partum moms ultimately brought her to open her family-friendly clinic. At Warman Physio clients are encouraged to bring their infants and children to treatment. Warman Physio has been nominated as a finalist for the 2018, 2017, & 2016 WMBEXA, is a WMBEXA award recipient of 2017 New Business Award, and a finalist in the ABEX 2018, 2017 & 2016, and Haylie was recognized as YWCA Women of Distinction for Health & Wellness in 2017, and has been nominated for the 2019 SABEX and WMBEXA Awards. https://www.warmanphysio.com/wp-content/uploads/2019/01/Carpal-Tunnel2.jpg 415 992 Haylie Lashta https://www.warmanphysio.com/wp-content/uploads/2016/05/warmanphysio-300x110.png Haylie Lashta2019-01-07 06:33:082019-01-05 21:41:49Carpal Tunnel - or a pinched hose?